It’s hard to believe, but a few short months ago, with share prices apparently unaffected by the US mortgage crisis, “going for growth” was a serious election topic. Now such talk seems trivial and irrelevant. The oil market is the first and most obvious culprit. While the issues are complex, we face a steady long-term decline in production that simply won’t go away. The sooner we stop the blame game and adjust to rising prices the quicker we can focus on more pressing matters. Two things that are infinitely more important than petrol prices are water and food. With less oil things will get tougher, but we’ll survive. Without water and food, it’s curtains. We seem desperate to keep the good times rolling, so we continue to focus on fuel while ignoring the real staples. But the food supply problems we’re now heading into didn’t happen overnight. For decades, we swallowed advice from economists and agronomists that a “green revolution” – genetically-improved crops on large, mechanically-farmed land-holdings – would guarantee a continuing world food supply. Rising output in developing countries into the 1980s suggested they might be right, but the continuing twin pressures of growing population and climate instability, including widespread drought in Australia and elsewhere, eventually revealed the flaws in their arguments. Add to this the problems faced by growers forced to buy new seed every year, because the genetically-altered, patented seed they used can’t generate new seed, and you have an idea why the “green revolution” may not be our cup of tea in tougher times to come. The unthinkable is now happening. Looking afresh at various farming options, agricultural specialists are starting to allow that they may have been wrong, after all, and that time-honoured intensive cultivation practices on smaller land-holdings may be more productive. This isn’t new. It’s been a background debate for half a century, but the dissent generally came not from “developed” countries but the likes of India and countries in Africa and South America. Old ways have managed to survive, but in parts of the planet by-passed by the growth machine. In Cuba, when Soviet aid was suddenly cut off, Raoul Castro (now the country’s president) presided over a program of establishing vegetable gardens on urban wasteland, enabling city-dwellers to do what our own grandparents did here as a matter of course. Suddenly having to manage without Soviet fertilisers, the Cubans found that their urban plots, treated with home-grown compost and intensive, loving care, delivered higher-quality produce in greater quantity than any of their chemically-fed collective farms. Despite its present drought problems, Tasmania is blessed with excellent food-growing conditions. Dealing with higher food and transport costs by developing, on our own, a strong local food economy is an entirely achievable proposition. We’ll have to re-discover some of the skills of our forebears, while adding some new knowledge from science and the organic farming movement. But it will take significant collective will and determination. Do we have what it takes? 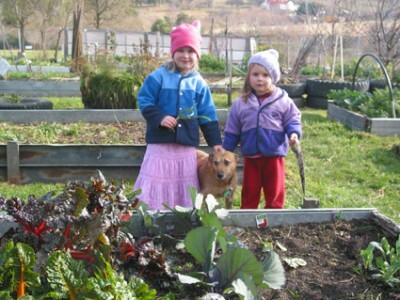 This entry was posted in community action, food, gardening, social and personal issues and tagged Africa, Australia, climate change, community action, Cuba, food, gardening, global warming, health, India, Miriam Herzfeld, Peter Boyer, Raoul Castro, South America, Tasmania. Bookmark the permalink.